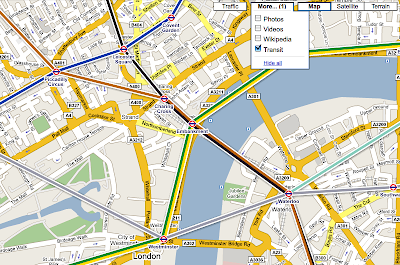 Finding your way around the public transit system just got a little easier thanks to Google Maps. Yesterday the folks at the Google Maps Team announced the launch of the Transit Layer on Google Maps in more than 50 cities around the world making life a little easier for citizens and tourists to access public transportation information in those supported cities. The full list of cities that Google Transit supports is Belo Horizonte, Berlin, Bordeaux, Brasilia, Cairo, Capetown, Caracas, Chicago, Copenhagen, Dallas, Dortmund, Duisburg, Düsseldorf, Ekaterinburg, Essen, Frankfurt, Genoa, Guadalajara, Hamburg, Helsinki, Johannesburg, Kazan, Köln, Lille, Lisbon, London, Lyon, Madrid, Marseille, Medellin, Mexico City, Melbourne, Monterrey, Montreal, Munich, Naples, Nizhniy Novgorod, Oslo, Paris, Perth, Portland, Porto, Porto Alegre, Prague, Pretoria, Recife, Rennes, Rio de Janeiro, Samara, San Francisco, Santiago, Sao Paulo, Seattle, Strasbourg, Toulouse, Tunis, Vienna, Warsaw.